Are classic cars dead as history repeats itself? "McQueen's Machines" author says sitting in King of Cool's Jaguar "gave me chills"
Tim Allen says he drove 1932 Ford too often -- "like using a Rembrandt for a placemat"
ATLANTA, Georgia (CNN) -- Today's automakers prize function over form, and there are few if any cars being made that will be "classics" in 50 years, comedian and car buff Tim Allen said. "I'm passionate about automotive art, and there isn't any," he said. Many enthusiasts argue classics are in the eyes of the keyholders, but Allen's not the only collector noticing history repeating itself. Chevy's new Camaro, Ford's Mustang and even Mercedes' AMG Gullwing harken back to designs popular five decades ago. "It's not an art piece, that Gullwing; it just reminds people my age, 'Oh, the Gullwing,' " Allen said. The 56-year-old actor said he'd like to see more designs like the 1962 Ferrari 250 GTO -- "the source of all cool cars" -- or the 1966 Shelby Mustang 350GT Hertz, which wasn't known for its handling. "It can't get out of its own way," Allen said. "It's like a Hawaiian shirt. Only guys think they're cute." Passion and handcraft are absent in today's cars, Allen said, and he yearns for more Shelbys and Scaglietti Ferraris, cars akin to those on display at Atlanta's High Museum of Art this month. 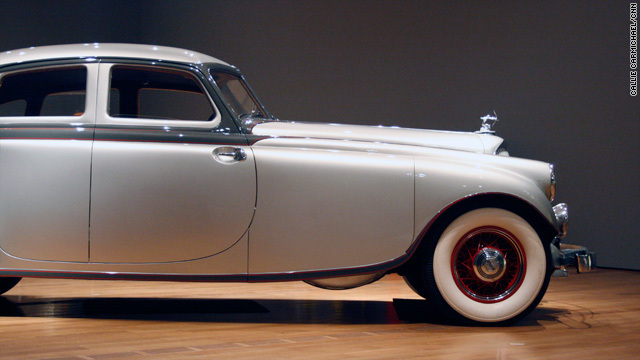 "Allure of the Automobile" features 18 cars manufactured between 1933 and 1959. Pierce-Arrow, Porsche, Bugatti and Aston Martin are among the honorees, and the exhibit includes two of Clark Gable's cars and a Jaguar XKSS Roadster once owned by Steve McQueen. Matt Stone, editor of Motor Trend Classic and author of "McQueen's Machines," said he once took the Roadster for a spin down Mulholland Drive in Los Angeles, California. "Just to sit in that seat gave me chills," he said. "To be sitting in that seat where the King of Cool used to go out street racing at night is pretty cool." Cool is often defined during adolescence, said Craig Jackson, chairman and CEO of Barrett-Jackson Auction Company. To Jackson, cool is the Porsche 911 Slopenose. "I'm looking for a good original," he said. "You always want in life what you couldn't afford and couldn't have when you were younger." Jackson has 28 cars in his collection, many stemming from his tastes as a young man who restored an 11-year-old Corvette Roadster because he didn't like the cars being built when he graduated high school in 1977. He likes "American muscle" -- think Plymouth's Roadrunner and Hemi 'Cuda -- but his brother, a drag racer, and his father, a collector of French cars and Cadillacs, also influenced his tastes. Hence his fondness for hot rods and the Delahaye 165 Figoni et Falaschi Cabriolet he sold in 1989 (he flew to Tokyo to "visit" the car in 2000). There's little dispute that Shelby Cobras and late '30s Delahayes are classics. Allen, Stone and Jackson concur that Ferrari Daytonas of the late '60s and early '70s also fit the definition. 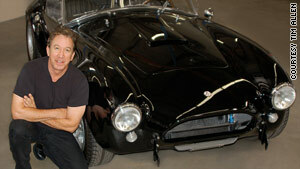 Tim Allen, seen with his 1965 Shelby Cobra, says he'd like to see more passion in today's car designs. Jackson is restoring one, he said. Allen said, "There was an art to that [car]." And Stone would sacrifice a great deal to get his name on a title. "I'm a Daytona fool," he said. "That's the one I'd probably sell body parts for." Stone believes classic cars embody a combination of style, performance, rarity and success, but differences of opinion abound: Allen believes performance can be tweaked and success is overrated. Opinions vary on new models, too. Stone believes the Ferrari Enzo, first built in 2003, could be an "instant classic." Jackson likes the re-releases of the Corvette ZR1 and Dodge Challenger. Allen had mild praise for the ZR1, but said, "There's nothing artful to it." He's unimpressed with the Enzo, and Denise McCluggage, an automotive columnist who is no stranger to Italian classics, said the comic is correct. "The Enzo Ferrari, as far as I'm concerned, could age right off the map," said the 83-year-old former racer who began competing when hay bales on an airport runway constituted a track. Her favorite car is a 1959 Ferrari 250 GT Berlinetta in which she won the 1961 Sebring GTIII. "It was not only my only car; it was my only thing. I had a Ferrari, and that was it," she said. 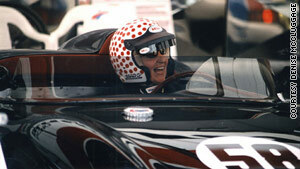 Denise McCluggage drives the Porsche 550 RS 60 at the car company's 50th anniversary in Monterey, California, in 1998. McCluggage said she sold it for $6,000 and a Mini Moke in 1962, long before the model commanded $1 million and Motor Trend Classic named it the fifth-greatest Ferrari ever. "Timing is everything," she joked. McCluggage and Allen might appear to have similar tastes, but McCluggage said she thinks classics might one day include distinct designs, such as the Mazda Miata and Chrysler PT Cruiser. At the same time, McCluggage said American muscle cars "were great in a straight line" but didn't appeal to her as a racer. "It will be surprising what people consider classics," she said, adding that when she isn't driving a car from the AutoWeek press fleet, she is tootling around Santa Fe, New Mexico, in her 1993 Suzuki Sidekick. "I always like the car I'm in. I'm very fickle that way," she said. Allen also is fickle. He modifies almost every car, a cardinal sin for collectors who believe original parts must be preserved. "They're never like I like them," he said. "The look isn't right. The sound isn't right. The performance isn't where I'd have it." The Detroit, Michigan, native said cars are for driving, and he recalls how he used to drive a 1932 Ford more often than he should have. "It was like using a Rembrandt for a placemat," Allen said. "But I can't let it sit there and not drive it." McCluggage chuckled when she called collectors who tow their prized automobiles to shows "trailer queens." 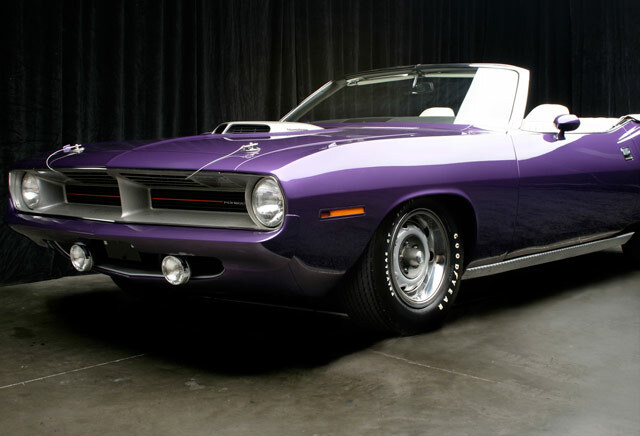 Classics or not, Jackson believes the days of the re-introduced muscle car might be numbered. Government ownership of GM and tighter fuel standards (taking effect in 2016) could bring a lull in manufacturing high-performance vehicles. In the 1970s and 1980s, public demand for safety and better mileage yielded cookie-cutter cars that Jackson said he couldn't differentiate on the freeway at night. Similarly, today, car companies might think twice before building 612-horsepower ZR1s that could skew a fleet's fuel standards. Experts agree technology advances more quickly today than it did in the 1970s, and Jackson has faith form can keep pace with function. Allen said he'll keep taking performance into his own hands, even if cars go electric. "I don't need the government telling me what to drive," he said.